Tom works out of his studio in St. Paul as well as many, many hours in the open air pursuing his art. He enjoys painting the beauty of our natural world, the woods, the streams, the hills and valleys as well as the structures placed upon it. Since graduating from Minnesota State University, Moorhead in 1987 with a BFA in art, I’ve pursued a career as a graphic designer. When I discovered plein air painting in 2007, I was hooked. It combines my passion for being outdoors with my love of painting. These days, I maintain my design business but I am working towards being a full time painter. 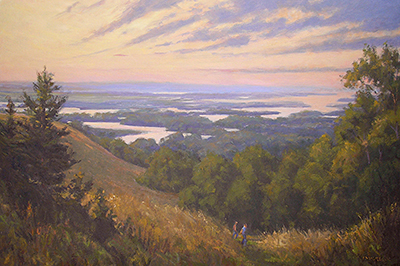 Head outdoors to paint landscapes with award-winning plein air oil painter Tom McGregor. You can capture the beauty of Fall in SE Minnesota in this one day class on Saturday, October 20, 9am-5pm. Whether you are a beginner or advanced plein air painter, we all face the same challenges while capturing the effects of fast-changing light. 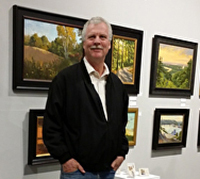 Tom will give a short talk and demonstration showing how to simplify the process while capturing atmosphere and light, and adding life to your paintings. Afterwards participants will go out into the fall weather to practice new skills. Painting outdoors gives artists a unique sense of place as they create; if you've never tried it, you'll love the opportunities and challenges of plein air painting! Panel Size: between 8"x10" and 12"x16"
I prefer panels tinted with a light wash of burnt sienna/Gamsol mix. Panels should be tinted at least 48 hours prior to the workshop.